It’s a big day for Project 333. We are celebrating 4 years of dressing with less, kicking off a brand new season, and a fun new challenge in the challenge, along with an awesome blog tour featuring people from around the world writing about their capsule wardrobe experiences. Whether you’ve been practicing Project 333 for years, or are jumping in for the first time … Welcome, I’m so glad you are here. Congrats for being curious and brave and wonderful. While you can start Project 333 anytime, today is one of the official start days. Gather up your 33 items and check the rules if you have any questions about what counts and what doesn’t. 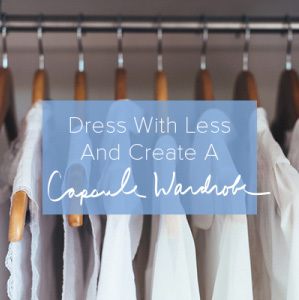 Join us on Instagram for awesome connection and community and consider the Dress with Less course to help you craft your capsule wardrobe. Use the new challenge in the challenge 33 in 33 to help you get excited and have fun with your new wardrobe. 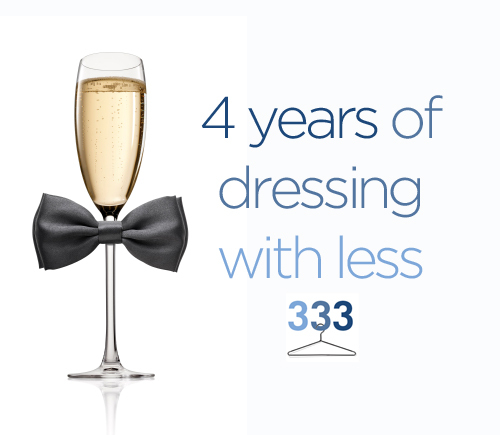 Simply share 33 different looks in 33 days. Be open to change from the outside in. Your light, calm closet and wardrobe has a way of making big changes in how you think about simplicity and what really matters in your life. This minimalist fashion challenge is about so much more than what you’re wearing. Talk about your Project 333 experience via blog, Facebook, Twitter, Pinterest and Instagram. Don’t forget to use hashtag #project333 and/or #33in33. Stories are inspiring. Check out the Project 333 stories below. Gather information and inspiration from them and from other articles on this site, and then write your own story. Your unique approach will make this a meaningful learning experience in the power of less. Fall/Winter Project 333 Capsule Wardrobe- for a business casual mom! Thank you for sharing your stories. If you submitted an article and it didn’t appear on this list, please feel free to comment below with the link. I hope this minimalist fashion challenge will be as meaningful for you as it has been for me. Learn more about the challenge here or take the course and please comment with your questions or experiences. I wanted to tell you how much I have been inspired by your books and journey to a simple minimalist lifestyle. Reading your books helped propel me on my own simplifying journey and I have joined in Project 333 starting today! I have a Pinterest Board set-up, but can’t figure out how to post to the community board? I am also posting my outfits/capsule wardrobe on Instagram! I am really excited about the next three months and seeing where this takes me! Thanks so much for the inspiration! an amazing collection of inspiring links – it is so great to see how many people experiment with this. I just finished putting together my smaller wardrobe for the third time. I joined Project 333 in July – and I made it! Surprisingly enough, I thoroughly enjoyed dressing with less the last 3 months! I did add 1 t-shirt and a pair of shorts (temporarily). 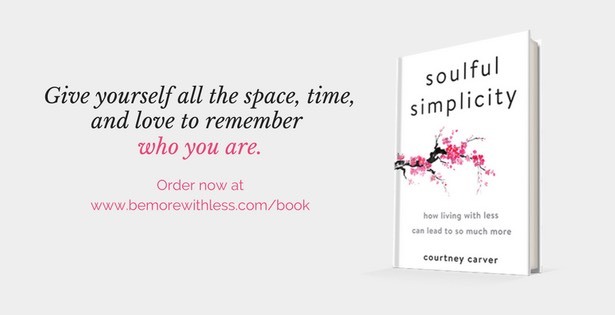 Thank you, Courtney, for a challenge that “added” so much to my life. I’ll probably keep the same items for the next few weeks and then change my capsule when our weather changes. Thank you for doing this and sharing these stories. All the different perspectives shows how realistic and rewarding Project 333 is! Oooh! I can’t wait to check out all those links! I love seeing what everyone else is doing. It’s in portuguese… Thank you! Courtney, thank you for sharing my blog! I really enjoy reading everyone’s stories and I find them really inspiring. I’ve been wearing my first capsule wardrobe for one month now, and it’s fun to share the experience with others. It’s so great to see how different people personalize the challenge and make it work for them. I’m trying P333 for the first time. I’m one of those people who own 250 items of cloths, dozens of sunglasses,shoes and 100s of accessories. which is why I’m totally hooked up the idea of P333. but as a first timer, it’s getting a little hard for me. I want to play by the rules without making my exceptional rules, even though there’s nothing wrong with that but still. it took me two days to de-clutter my space. now I’m set with 21 clothing items, 4 bags, 4 shoes(flats,heels, belly and sports). that leaves me at 30 and I’m happy with it. but if I include my accessories then it gets to 42.
my question is a little silly but still asking since I’d like to be sure. does ears studs count? those ear hugging really tiny things. one more question, I always see only one purse in your list. Is that a money wallet or shoulder bag(like toot bag or something for carrying umbrella,water bottle etc) ? I’m confused, if you only carry wallet, where do you keep other stuff while going out? and if that’s a shoulder bag, where do you keep money and bank cards etc? or is it that wallets don’t count? please help me with it. it’ll help me make my list with more clarity. Rose, I include a small purse and my laptop bag in my 33. I also have a small wallet/billfold that I don’t include. Feel free to build your 33 to work for you and your lifestyle. Hey Courtney! I have been following your blog for years and just wanted to say thank you! You are by far my favorite blogger and I look forward to your posts every single week. 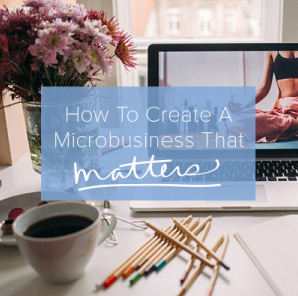 Over the years some of the blogs I follow have become stale, but your posts continue to give me clarity and have helped me so much along my simplicity journey. I have always wanted to try Project 333. However, once I start trying to pick out my items I get confused and never follow through with it. I manage an athletic apparel and footwear store, so all I wear 5-6 days a week is workout clothes. So I suppose my Project 333 might look a little different from most people due to this. I also usually even wear them running errands, even though you say not to, because I typically do that on my way to or from work. So you say workout clothes don’t count, but for me I think they probably would, since due to my career they are my primary wardrobe! I think I’m just thinking about this too deeply. Any suggestions? Thank you Shannon, Keep it simple to start and count your work clothes as one or two pieces and then build around that. I joined a while back and I’m getting rid of more. Jewelry and shoes I never wore. A coat and a skirt. I have 2 scarves I will try to use as accessories. This forces me out of my comfort zone.